MOORE called home December 2nd 2018, suddenly at Hospital in London after a long illness, Carolyn Ann (Carly), Ballymena, much loved daughter of Norman and Joy, and precious sister of Nicola. Following a Private burial, a service of thanksgiving for the life of Carly will be held in Ballymena Baptist Church on Sunday 16th at 3pm. 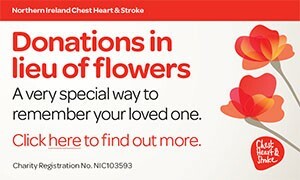 Family flowers only please donations in lieu if desired and payable to Asia Link C/o Alan Francey Funeral Services 94 Toome Road, Ballymena BT42 2BU. Will be lovingly remembered and sadly missed by the entire family circle at home and abroad. I am sorry to tell you that Carolyn Ann (Carly) MOORE has passed away.